Did you know the average American checks their phone every 12 minutes? That’s nearly 80 times per day. What does that mean for text message open rates? A pretty noteworthy number: 98%. The point? People are constantly checking their phones, and their phones are always nearby. 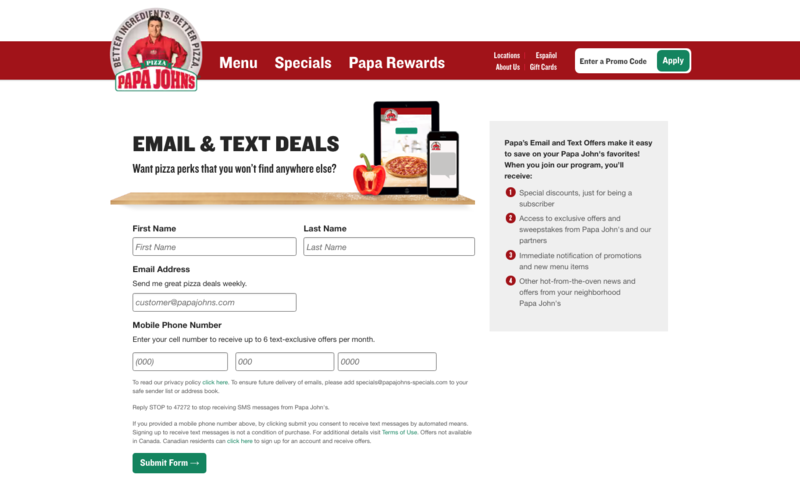 Plus, open rates for texts greatly surpass email open rates, which hover around 20%. As digital marketers and an Iowa web development company, we talk about mobile SEO, responsive website design and even social apps like Facebook Messenger, but one of the most underutilized tools in the marketing tool belt is still text message marketing. Text message marketing - or SMS marketing - is the act of sending coupons, special deals, announcements, current events and other information to your customers via text message. In short, SMS marketing is simply a quicker, easier and direct way of reaching your customer. At Blue Compass, we always think of all of the Chipotle text alerts we receive around the office. The convenience of receiving deal alerts or exclusive promotions directly to our phones makes for super easy lunch decisions! Not only is Chipotle speaking directly to us, their customers, at the exact moment we could make a decision or make a purchase, but they’re also engaging with us on a personal level. Another form of text message marketing is MMS marketing. While SMS stands for Short Message Service, MMS stands for Multimedia Messaging Service. The difference? Exactly like it sounds. An SMS message is what comes to mind when you think of a standard text message that’s roughly 160 characters long. An MMS message is any text message that includes multimedia content, such as a video or image, or messages that are longer than 160 characters. Some marketers think SMS and MMS marketing is heavily regulated, but it’s no more regulated than email marketing. Just like you need individuals to voluntarily subscribe to your email list before you actively send them emails, you also need to give people the option to “opt-in” to your text message marketing efforts. Likewise, people should also be given the option to “opt-out” of your text messages whenever they’d like. Fortunately for marketers and prospects alike, customers have an easy way to opt in or out straight from their mobile phones with most SMS marketing services. To put it simply, text message marketing has the best engagement rate of any marketing medium. While emails can go unread for days, 90% of text messages are opened and read within the first three minutes of receiving them. What’s more? Mobile phone ownership among adults is close to 95% worldwide. And with no internet requirement for sending and receiving text messages, SMS text messaging is the communication tool with the greatest reach around the world. Most SMS and MMS marketing services have trackable platforms. Just like your other marketing efforts, you can manage your text message marketing campaign straight from your desktop. For example, text message marketing service, SlickText, is a web based platform, so there is no app or software to download. You manage everything within their dashboard. SMS and MMS marketing allow you to receive quick feedback from your recipients by including a “reply” button or a link to a landing page. You can deliver short messages to your audience that direct them back to your site so they can quickly interact with your brand. 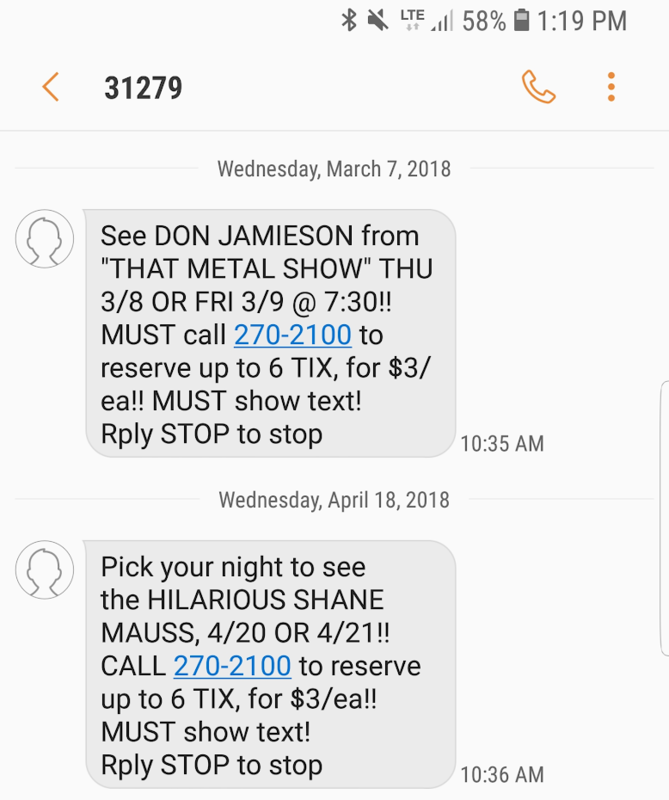 For example, Funny Bone uses text message marketing to promote reservations for comedy shows. Another great advantage to SMS and MMS marketing is that it doesn’t take long to gain important insights. Once you hit send, your message is delivered almost instantly. You can set up a text message marketing campaign and have hundreds of clicks or user feedback within minutes. 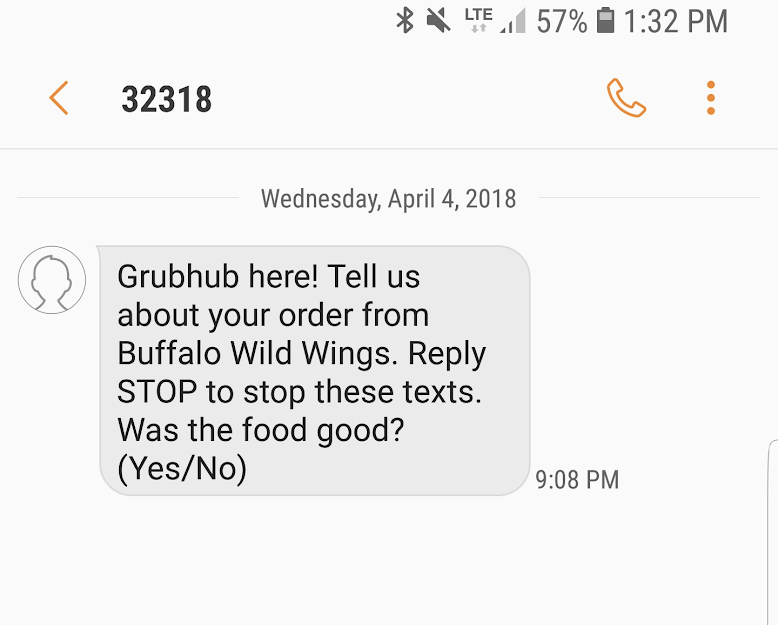 Take a look at how food-delivery service GrubHub uses SMS marketing as a quick way to learn about the food they just delivered. An additional advantage of SMS marketing is the opportunity to add a personal touch to your message. Using words like “your” and “you” are great ways to keep people interested in to your SMS and MMS marketing efforts. 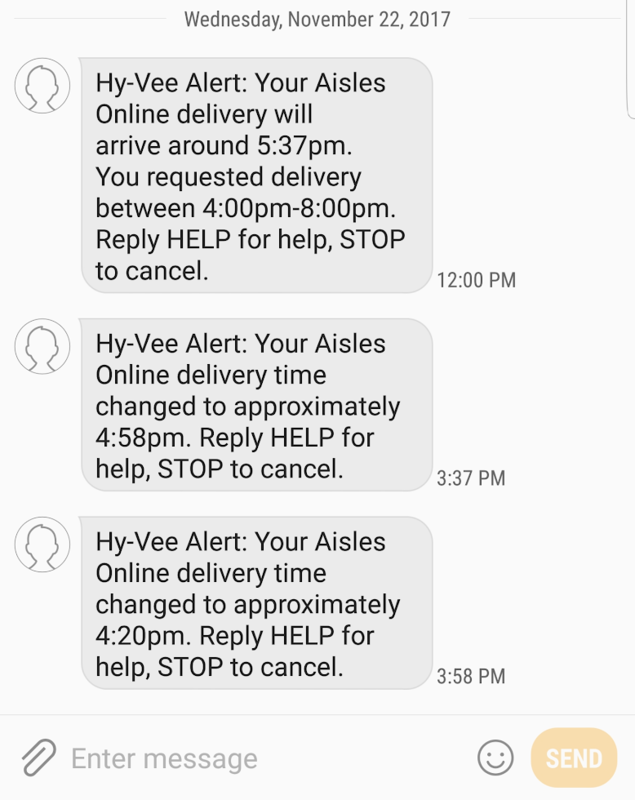 As you can see below, local grocery store Hy-Vee does a great job of personalizing their text messages. Needless to say, the opportunities with SMS marketing are truly endless. From instant user feedback to gaining clicks and conversions, you can be as creative as you want. The basic components of any SMS marketing campaign include a keyword and a shortcode. Text “FLAVORS” to 123456 for our flavor of the day! “FLAVORS” is the keyword users type in the body of a text message, and “123456” is the shortcode to which users will send their text message. When a user sends a keyword to a shortcode, this is considered their “opt-in.” (Pretty easy, right?) Once a customer is in, you have a few options. You can send them a quick follow up SMS message and let them know what to expect next, or you could add them to a list to be used for future campaigns. Of course, there are other ways to get people to sign up for text messages, such as filling out a form or submitting their phone numbers on your website. If you do decide to go this route, you will need to send a verification text to make sure users meant to opt in to your text message marketing service. For example, you could send “Text YES to receive monthly deals.” Once a customer has officially opted in, you can engage with them further by sending them sub keywords. An example of sub keyword could be something like “NEW OFFERS” to trigger an automated text alerting customers of new menu items. Another important sub keyword is “STOP,” giving customers the option to opt out of your SMS messages. Once you’ve got the basics down, the sky's the limit. The next step is to decide which platform to use to run your text message marketing campaign. As a digital marketing and responsive web development company, we created our own customized text message marketing solution for our clients in all industries. Our SMS marketing capabilities range from delivering a standard coupon or news update, to being able to create tailored subscriber lists that you can send personalized messages to. Our system also retrieves dynamic data and can incorporate interactive voice responses (IVR) to send a text message back to. With these features, you'll be able to send strategic, customized campaigns to increase engagement and sales. There are many platforms out there, so if you're looking for the right fit for your campaign, below is a list of some other text message marketing platforms you can explore to learn more. One of the great things about SMS and MMS marketing is the creative freedom that comes with it. Below is a list of a few ways you can engage your customers in your text message marketing efforts. Perhaps the most obvious tactic is sending customers exclusive deals. Everyone wants to feel like their in the loop, and your subscribers will stick around if they feel they're getting a lot of value out of the texts. For example, if you are a restaurant chain, you could offer subscribers a free side with the purchase of an entree or a buy-one-get-one-free dinner special. Drip campaigns are another great way to keep customers engaged via SMS marketing. These could be sent based on how long people have been subscribed to your text message marketing service. Think of your drip campaign as another form of marketing automation. The longer a customer has been subscribed, the better the offer. In other words, you’re incentivizing your audience to stay engaged with your SMS campaigns. Let’s use exclusive deals as an example. You could send a subscriber a 5% off coupon as soon as they opt in to your SMS campaign, a 10% off coupon after they’ve been subscribed for a few weeks and a 20% off coupon after they’ve been subscribed for a few months. These types of SMS messages can be automated, so it’s less work for you. With most SMS marketing services, you can poll your customers. It’s no secret customers like to share their opinions - it allows them to feel a part of the decision-making process. Creating polls for subscribers to engage in allows them to be a part of the conversation while allowing you to learn unique information about your business and customer base. Contests are a fun way to increase engagement with SMS marketing. From offering small deals to anyone who opts in, to offering a grand prize to one random subscriber, running an SMS contest is a standard promotion tactic that sees a lot of action. Who doesn’t like to win free stuff? Just like with most content pieces, including images or video in your SMS message - making it an MMS message - increases engagement. Visual media accompanying your message, deal or contest adds depth, interest and more information to the overall message invariably leading to more engagement. One thing to keep in mind is that, unlike an SMS message, an MMS message does require an internet connection to receive and will use your client’s data allotment. Just like you can get as creative as you want with SMS messages themselves, there are also a few different ways you can grow your SMS subscriber list. One way to grow your SMS list is by utilizing lead generation ads on Facebook. Lead generation ads on Facebook are a great way to collect data and build up a large subscriber base. Another great way to build your SMS list is to use email marketing. Customers who are subscribed to your email list are already interested in your brand. Creating a campaign inviting these customers to join your SMS list for even quicker updates and special offers can help you promote and grow the engagement with your SMS marketing campaigns. As a leading Iowa web development and digital marketing company, we understand the need to have a digital strategy that works in collaboration with all of your marketing efforts. If you’re ready to take your marketing efforts to the next level, our digital marketing team would love to assist you in creating an SMS marketing strategy, and our responsive web development experts have created a service that can bring the campaign to life. Contact one of the experts at Blue Compass today!